Even though most people have heard of solutions such as TeamViewer when it comes to accessing one remote PC, it is a lesser-known fact that Microsoft Windows has an inbuilt feature to let you do that. That is, even when you lack all those TeamViewer stuff, you will be able to remotely control another Windows PC and at the same time allow the PC of yours to be controlled by another person. If both computers are connected using a Local Area Network, it’s better than third-party solutions, but it might be a bit time-consuming to get used to Windows Desktop Connection. In the latest version of Windows, however, there are some slight changes in terms of Remote Desktop Connection! If you are new to it, you may have some issues as well. 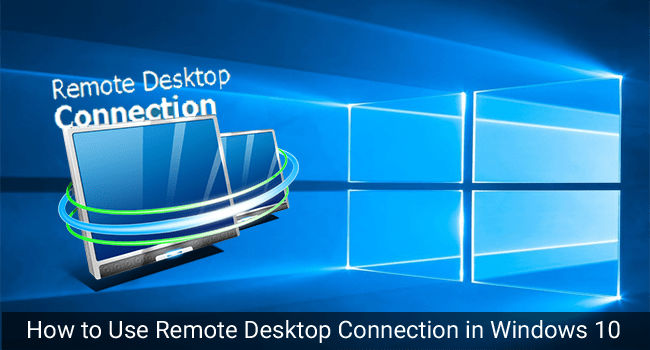 To let you use Remote Desktop Connection in Windows 10, we have created a comprehensive tutorial about enabling and using the remote desktop connection in your Windows 10 PC. To Be Noted: As you might know, there are two major versions of Windows 10 — Windows 10 Home and Windows 10 Pro. In both the versions, capabilities of Remote Desktop Connection are different. Suppose you are running Windows 10 Home on your PC; then, you will not be able to let others use your computer. In shorter words, Windows 10 Home does not support incoming remote desktop connections. On the other hand, as we come to the case of Windows 10 Pro, both incoming and outgoing remote desktop connections are supported; you can let others use your PC and use other PCs over the network. Well, before you do something about remote desktop connections and all. There are some things to be taken care of in the Target PC. By Target PC, we mean the computer, which is going to be controlled using the RDC. And, you’ll be able to use a PC as target PC only if it is running Windows 10 Pro. This is a more important part. In order to let the connection reach your computer, you have to enable the Remote Desktop Connections in the target PC. To do that, you can follow the steps given below. If you want to reduce messing stuff, you can un-check the checkbox given below. If not unchecked, it’ll cause some troubles during the connection time. If you have done all these, you can press the Apply button, and then ‘OK’ to close it. So, you have successfully enabled Remote Desktop Connections in your Windows 10 PC. Before you move on, you should know the IP address of your Windows 10 target computer. What is to be noted here is that a static IP address is easily available in the LAN scenario, while the Internet-based connection can be more or less troublesome. To find the IP address, you can follow the steps given below. From the list, find the IPv4 IP address of the computer, which is a numerical combination with dots between. Obviously, this is done from another PC, which may run Windows 10 Home or Windows 10 Pro. In both the versions, the options are same and you don’t have much stuff to mess up with. Some things are to be taken care of, though. For instance, as we said before, both the source and target computers should be connected to a Local Area Network. If the connection is working and rest all set, you can follow the following steps to get its Remote Desktop Connection done. Upon providing the prompted data, you can see the fully-fledged remote desktop on your screen. Now that you have connected to the target PC, you can do whatever you want. If there isn’t a person at another end of the connection, it’s advised to turn off auto-power-off modes of your lap, so that connection won’t be messed up. So, you have seen how to enable and use Remote Desktop Connection in Windows 10, over Local Area Network. Do you have any better alternatives, by the way? This is cool, useful if you are troubleshooting friend’s pc, helping him out with his pc problem without going to their place. There are several free utilities out there that will get you set up with a remote connection. Some that come to mind are join.me, TeamViewer, and Chrome Remote Desktop and are especially handy when connecting between different platforms. Another noteworthy post from Techlila. Nice way to remote desktop connection in windows 10 . Thanks for sharing this nice post with us. Thanks for sharing this helpful post. Team Viewer is the best way to connect. Most of the people use Team viewer for connecting pc even me also ,I think its a good way. I read your post and I would like to say thanks for sharing this information. Apart from above, you may try tools like logmein, R-HUB remote support servers, teamviewer etc. for remotely accessing Windows 10 and MAC computers. They work well. Thank you Prasanta. These are really good additions to the post.